What Exercise Can I Do to Replace Burpees? The "burpee" is one of the most effective (and dreaded) exercises because it engages multiple muscle groups, requires aerobic capacity, burns calories and only requires your body weight. A burpee is done by squatting down and putting your hands on the floor, jumping your legs backward to plank, then inward before standing again. If a burpee is too difficult or aggravates particular injuries, you may want to modify the move or perform a different exercise. Safety should come first in any exercise program. Some people have injuries that make it difficult to complete certain parts of a burpee. Others may simply not be fit enough to complete an entire burpee. It's okay if an exercise is challenging, but don't sacrifice form in order to complete a repetition of any exercise. This means you may have to do a modified burpee or another exercise altogether to accomplish the same or similar work as a burpee. You can easily modify a burpee by doing them more slowly and by taking out the jumping movements. This can be helpful for people who are overweight or unfit or for those with sore joints. To compete a modified burpee, squat down, step your legs out into plank one by one, then step them back into a squat and stand up without jumping. This version is gentler on the body and takes less energy to complete. If squats or jumping are difficult, you can perform different portions of the burpee as single exercises to work the same muscles. Pushups and planks will work many of the same muscles involved in a burpee, including the arms and core muscles. To strengthen your core muscles, hold the plank position for as long as you can. 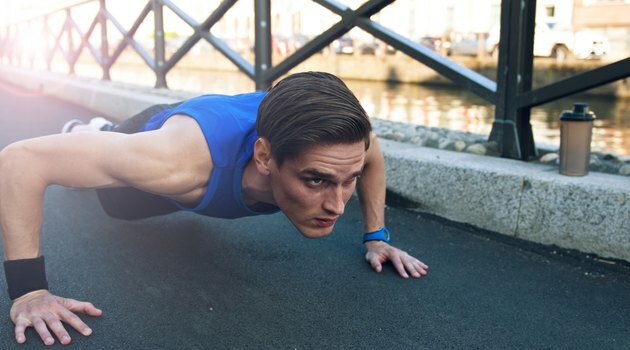 Planks can be performed on your hands in pushup position or on your forearms. Tighten your abs and keep your body flat -- avoid curving your body upward, and don't let your back sag. You can also do pushups, either from your toes or your knees, to work both your arms and to build core strength. Squatting is another important part of the burpee, working the large muscles in your legs like the glutes, quads and hamstrings. To do a squat, keep your knees over your ankles and lower yourself down as if siting in an invisible chair. There are many variation to the squat, with varying difficulties. If you need help, you can hold onto a chair for support. If you need more of a challenge, you can hold weights or even do a jump squat.